In today’s art world portrait artists are very diversified in styles and way of commission approaching. As some famous artists styles are very sketchy look, some others use a highly realistic appearances. Accordingly, the portrait commission charges are also much diversified, from few hundred dollars to few hundred thousand dollars! This big difference is mostly based on every artist fame, popularity and level of connections. Style and quality are not necessary a reflection of the cost. Lorenzo’s portraiture work bare two distinctive characteristics on the way the final portrait paintings are created. Some are done in a relatively short period of time, with a highly live setting model appearance and applying a very popular painting technique called “alla prima”. The other portrait paintings are done in a more sophisticated fine art technique, which includes several sketch studies prior to even start on the final painting. The final portrait painting is very detailed and has a "Classic Academic" look appearance, which can be defined by some as a formal look as opposed to the more casual style on the “alla prima” portrait. Based solely on the time consuming as well as his current price market, Lorenzo’s charges for portrait commissions are very competitive in the art world. Portraits in the modern sketchy ”alla prima" style are very popular and the cost is less than a third of the cost of a "Classic Academic" portrait. “NICOLE” portrait was done from several life drawing portrait sketches as Lorenzo got acquainted with Nicole’s facial futures and decided for the final pose. In the classical Venetian tradition, grisaille (or verdaccio) was the first color tonality applied on canvas followed by many different layers of color glazing as the painting allowed after necessary drying time. From start to finish, the painting took 2 months for completion. Created as a sample of his art of portraiture, Lorenzo proudly keeps “Nicole” painting in his studio art collection of paintings and drawings. This portrait commission was done using several photos provided by the client. Dr. Carney expressed his intention to have a portrait for his office and to have a live warm and casual appearance to the viewers. The portrait painting function was not only to decorate the wall, but also to facilitate the connection between the doctor and his clients. Following is a list of Lorenzo’s prices for drawings, pastels and “alla prima“ portrait commissions. Prices are as reference only, they may vary according to the final design. Additional background elements or pets may change the complexity and the price. Posthumous portraits are based on the quality of the photos provided by the commissioner. Framing cost is not included. The studio assistant will help you in establishing the portrait purpose, size, pose and background details. The price, future meetings and completion date are scheduled. Lorenzo will work with the model for 30-60 min., to establish the best view angle, lighting and expression. Quick sketches, charcoal or conté and digital images will be taken. 50% of the established price will be charged. Lorenzo will complete a color rendering monochromatic of the proposed portrait painting based on initial sketches and digital images. The studio will send you (via email or regular mail) the image for approval. Lorenzo will work with the model for 30-60 min. to establish facial details and skin color features. Also final digital images of the pose will be taken. Additional 25% of the commission will be charged. Lorenzo will complete the painting and present it to you framed. If suggested, light touch-ups of colors and shades will be performed; otherwise the painting is ready for the final varnish. The remaining of 25% payment is required. 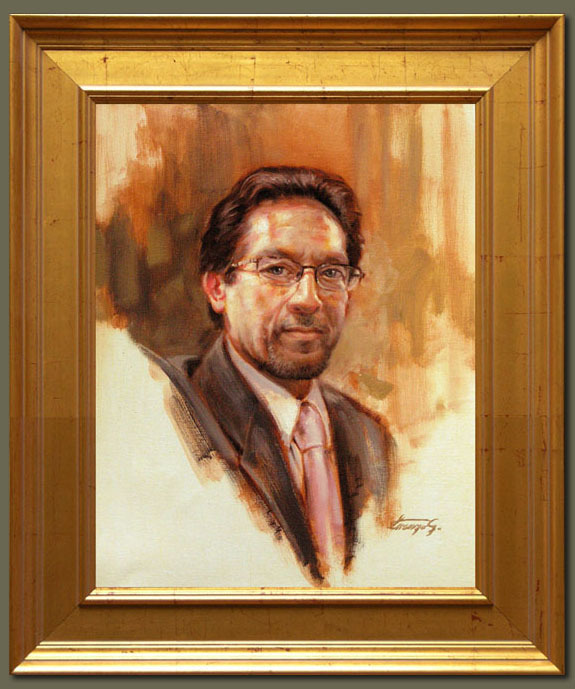 Commissioned portrait painting is complete and can be picked-up from the studio or delivered to you.Note: Lorenzo has been commissioned many times to do portrait paintings without having the opportunity to meet the subject prior to completion of the portrait; however, studio quality photographs were provided and different schedules were arranged. Satisfaction Guarantee: Beside a wonderful portrait you’ll also going to own one original custom painting by Lorenzo. (Representative Galleries have sold Lorenzo’s work with an increase annual percentage of 10 to 20%). Great effort is made to accommodate everybody’s’ schedule and special gift dates, so is better to place your commission earlier. Normal completion time is 4 to 6 weeks, however sometimes (before winter holidays) takes a little longer. Lorenzo charges for commission portraits are changing annually, now until the end of the year his prices for one subject start at $280 for a 15"x12" head only on charcoal to $700 for a 19"x15" head & shoulders on pastel and up to $8,000 for a 60"x48" full body size oil on canvas. 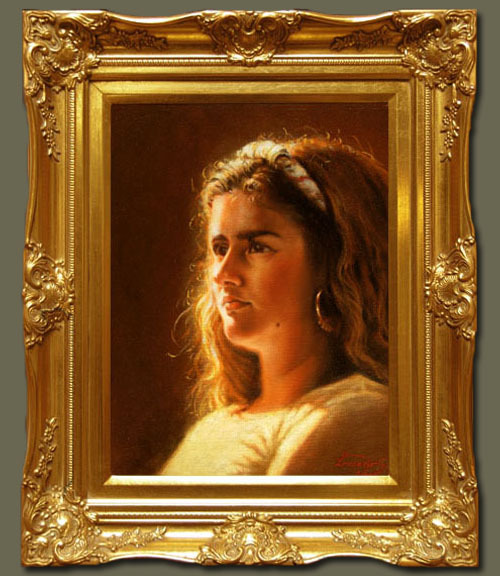 Most common portrait size is 20"x16" head & shoulders and the price is $1,200 for an oil on canvas.